The hostel is well and modern designed. There are different sizes of rooms, from 4-bed dorm to triple room to meet guests’ needs. The rooms are clean and comfortable, equipped with telephone, internet access, TV, air-conditioning and 24 hours hot water. 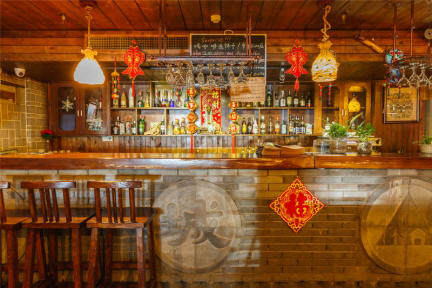 There is a small restaurant on the first floor which can offer guests delicious western food, coffee and drinks. There are also free computer, pool table, table tennis and gym equipment available to relax after the trip. The hostel also provides bicycle rental and laundry service to make your stay convenient. The hostel was very good, with very good location, on the subway line of the north railway station. Beds are very confortable and it's clean. The lobby is nice and friendly. Possibity to leave luggages, to buy drinks, to have a breakfast. The staff speaks a well English. Perfect hostel. Great location, 20 seconds walk to the metro, close to the Muslim area, rooms are really nice and with lots of space & lockers. Lounging area is perfect and they offer cheap beers as well . Would recommend this hostel to everyone! It’s a quiet hostel and a clean place to sleep. I was grateful for always hot showers and security lockers in the rooms. The hostel isn’t focused on entertaining guests or getting young people together to party, which was more than okay with me. The staff was super friendly and accommodating. They allowed me to leave my luggage for a few hours after check out to do some more sightseeing before my night train. The hostel restaurant area serves breakfast only but drinks and coffee all day. Convenient location within the city. The staff are friendly and can advise on how to get where you want to go. That said, the hostel and staff are not proactive in building a social atmosphere. There are also a few guests who appear to be living in the hostel long term. The one I met was a friendly guy, but this situation adds to my impression thgat the hostel ultimately does not care about building a fun atmosphere for travellers. Not much of an atmosphere but gets the basics done. Their English tours are marked up about 40%+ from their Chinese equivalents. I stayed at this hostel a few days and the facilities are brilliant, everything is clean and the location is perfect, just down the road from the Bell Tower and about 10 meters from two subway lines. 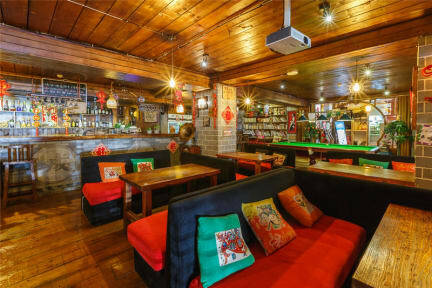 There is a well equipped bar with cheap beer and the reception staff are really friendly and helpful. All of this makes it so hard to explain how empty the place was... it's empty almost all the time and the atmosphere is funeral-esque. If you want somewhere fun and interesting in Xian try Park Qin. Great location but when we arrived we found out they had put us in separate rooms. We asked if we could be placed in the same room, but they said we couldn’t because they were full. That wasn’t true, there were 2 empty beds in his room the whole time we were there. Also the staff wouldn’t help show us which tab to use to buy terra cotta warrior tickets on the online Chinese website. We think they wouldn’t because they offer a tour. Also found a cockroach in my room and flies in the shower.